The Rotary Club of Auburn Alabama? awarded 15 Community Needs Grants totaling $33,985 to 15 local community organizations to further their respective missions on July 1, 2015. These grant funds resulted from the club's 2015 Rotary Riches fundraiser, its annual community fundraising effort on behalf of the club's foundation. 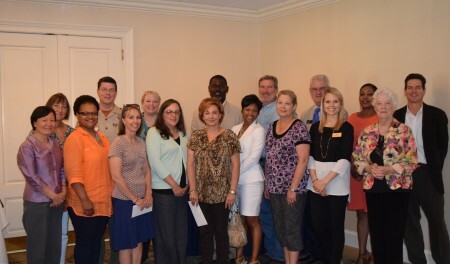 Pictured are the 2015 Grant Recipients from the following organizations: Alabama Rural Ministry; Auburn Daycare Centers, Inc.; Boys and Girls Clubs of Greater Lee Co.; Boy Scout Troop 50; Community Market/Food Bank of East AL; Domestic Violence Intervention Center; Lee County Habitat for Humanity; Lee County Literacy Coalition; Lee County Partnership for Children; Lee County Youth Development Center; Lee Russell Aging Foundation; Mercy Medical Clinic; Salvation Army of Lee County; Storybook Farm; Women’s Hope Medical Clinic.